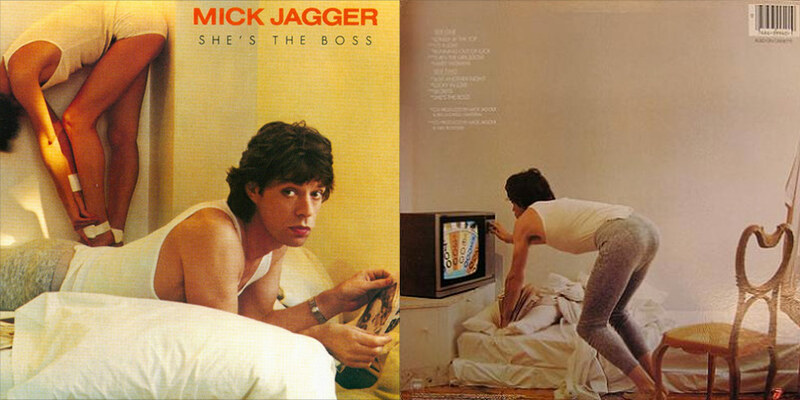 Mick Jagger’s first proper solo album, “She’s The Boss” was released in Feb 1985 and was an immediate worldwide hit. The first single “Just Another Night” was a number 1 US Rock Chart hit, as were subsequent singles “She’s the Boss” and “Lucky in Love”. The album was clearly a 1980’s dance record. It overflowed with cool production tricks and the songs sounded very muscular. Mick’s unerring eye for talent led him to engage 2 uber cool producers to co-produce the tracks on the album with him. The first, avant funk king Bill Laswell’s producing credits had included Herbie Hancock’s seminal “Futureshock” album as well as classic late 1970’s and 1980’s funk albums featuring members of Parliament-Funkadelic, Maceo Parker and Sly Stone. The other producer, Nile Rodgers had done the producing chores on David Bowie’s “Lets Dance” and “The Honeydrippers Volume 1″ featuring Robert Plant, Jeff Beck and Jimmy Page. Mick started composing the songs for his solo album in 1983. The musicians engaged by the three producers for the sessions included Jeff Beck, Sly Dunbar, Jan Hammer, Herbie Hancock, Robbie Shakespeare, Pete Townshend, Chuck Leavell, Lenny Pickett, and Michael Shrieve. In all, 30 of the top musicians of the decade performed on various tracks. Herbie Hancock, who added an amazing garageband organ to “Lonely at the Top” commented that he “didn’t realize that Mick had such an amazing sense of poetry in his conception of music. He gets you to bring out what he wants from the music with gestures or sounds or facial expressions. I’m used to seeing that from jazz players”. “I started off with the rhythm section of Sly Dunbar on drums and Robbie Shakespeare on bass, along with Jeff Beck on guitar and Jan Hammer on keyboards. And then everyone else just seemed to jump in. Unlike all of the popular records of those days which were recorded in layers, my record was more or less recorded live with this core group of musicians and then added to. I knew it was never going to sound like the Rolling Stones, and the great thing about it was the mystery. I was throwing elements together, and I didn’t know what was going to happen, nor did the musicians. And we were all having fun”. Read more about ‘She’s The Boss’ on Wikipedia.